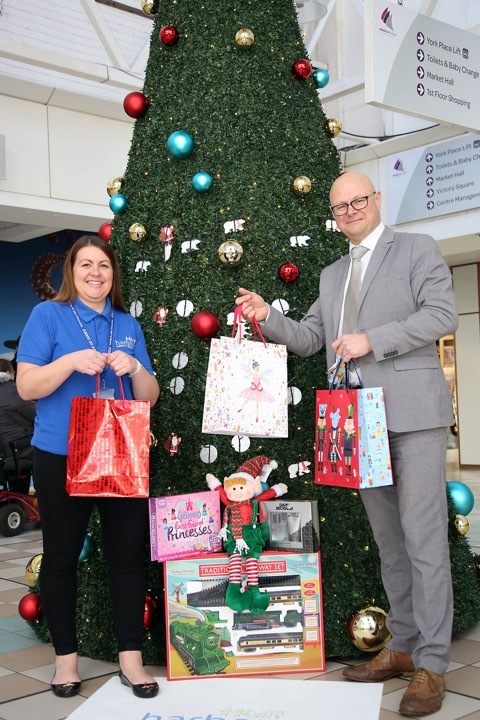 Middleton Grange is once again teaming up with local charity, Harbour to launch its annual Christmas campaign, the Giving Tree and is calling upon the extraordinary generosity of Hartlepool shoppers to donate presents to local children. Last year saw a staggering 1,274 gifts donated to the campaign and, now in its 12th year, the Giving Tree will be decked out with special tags, each one specifying details of a child’s age and gender. Customers are invited to take one and purchase a present for a local child. To get involved all people have to do is select a tag from the tree, buy a gift and take it to the Bonnie Babies store and Catcote Metro. They will then be collected by Harbour and distributed to children whose families are currently receiving help from the charity. Harbour offers 56 units of refuge accommodation across the North East to women and children who are leaving an abusive relationship. The refuges offer open access, 24-hour cover and a range of support and guidance services for women and children. There is also support available in the community to those who need help and advice about how to keep themselves and their children safe. Joanne added: “The children and young people we work with have been affected by domestic abuse in their home, which effects everyone differently. When they first come to us they’re often frightened, confused and vulnerable. We listen to them and acknowledge what they have been through then help them to move on from it. The Giving Tree can be found on the upper level adjacent to Iceland and Bonnie Babies store at Middleton Grange. Gifts can be left with the Bonnie Babies store or Catcote Metro every day until 12pm on Christmas Eve.